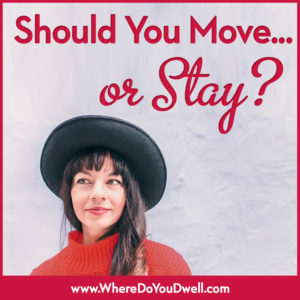 Should You Move or Stay? Your cozy home now feels cramped. Your hip neighborhood now feels noisy. Your job and commute have now changed. Your oldest kid starts school next year. Your youngest kid graduated from college. You change. Life changes. And so do your needs and wants. Whatever the situation, your home just isn’t a good fit for your family’s needs and lifestyle anymore. It’s easy to put up with your current situation, but why not consider a new home. Equity in your home. If you have owned your home for five or more years, then you should have substantial equity. This is when your investment pays off and you can use this equity toward the purchase of your next home! Financial Outlook. Your employment is steady, your income is improving, and your entire financial situation looks good now and down the road. This means three things: 1) You will get approved for a mortgage; and 2) you can afford higher mortgage payments; and 3) you can own a more expensive, larger home. Healthy Housing Market. If the market is stable or flourishing, than it’s a good time to sell your current home and buy a new one. Homes priced right will move and that’s good if you’re a seller like you. It’s better to avoid a sluggish time in the market. Your home could take a while to sell and who wants to drag it out and not get the price you were hoping for. Low Interest Rates. Interest rates are still historically low right now and a great deal for you. Moving can be very affordable right now, especially if you plan to buy a larger, more expensive home. Plus, you need to sell your home and low rates attract more buyers for your home. Location, Location, Location. When you bought your current home, it probably felt like the perfect location for you, but maybe not now. So many variables go into what makes a good neighborhood for you and your family at this specific time. It might not be a kid-friendly neighborhood and you want a better school district, or you changed jobs and now spend more time in the car, or maybe the neighborhood itself has changed. Maybe your quiet street is now too busy. Perhaps you want a stronger community feel or a more walkable neighborhood. Or you want a larger yard and more space between neighbors. It all comes down to what you want now and where you picture yourself living. Plan to stay at your next home at least five years, and what your life is going to be like then. Can’t or Won’t Remodel. You love HGTV and can just imagine your home remodeled and updated with larger rooms, gleaming kitchen. Where’s Chip and Joanna when you need them! But you realize it’s only a Fixer Upper dream. Your yard is too small for an addition, you’re not zoned for it, or you just can’t live through the mess or cost. Plus, you never want to be the nicest house on the block. Moving can provide you with more sanity, more room, and you can ditch the rejiggering of the floor plan. Space Invaders. You want to increase your home’s size since your family is growing OR you want to downsize since your kids are gone. Whatever the direction, you’ve realized the size and space of your home doesn’t work for you and your family anymore. You want space for toys (yours and theirs!) and to say good-bye to cluttered, cramped rooms. Or, you don’t need 4 bedrooms anymore and want a more manageable home and yard. Space needs can change dramatically in a short period of time so plan accordingly for down the road. Green Acres. Homeowners either love big yards or hate them. Have you figured out what you like? Yard space can be a wonderful addition to your home — for entertaining friends, for kids, for dogs, for gardening, for just getting some fresh air. Even a small patio or deck or even a nearby park may be what you are looking for next. If you don’t want to mow every Saturday or don’t have enough privacy between you and your neighbor’s yard, and it’s nagging you. Every. Single. Day … then it’s time to move. Life Changes You. Where you live affects your life and vice versa … your life will affect where you should live. If you’re a growing family, a newly single mom, or empty nesters, you want a home that reflects you and your new needs. A condo unit and all of its amenities were perfect for you when you were on the go with travel and work. But maybe you’re more settled now and ready for a townhome or single-family home to take care of and spend time in with family and friends. Or maybe you weren’t “ready” for a single-family home and its responsibilities a few years back as a first-time buyer. Now you’re a confident homeowner and you want your own space and yard and not deal with your condo’s rules anymore. Sometimes you can anticipate upcoming life changes that will happen in the next few years. It’s good to be prepared and perhaps plan an earlier move, especially if the housing market is good and rates are low. Timing can make or break the affordability of certain homes. If you want to know if moving makes sense for YOU and your particular situation, please contact jennifer@wheredoyoudwell.com and we can discuss what makes most sense. Despite what you might think, sometimes the answer is no, doesn’t make sense or no, not now. We’ll always look at what’s in your best interest and help you with making the right choice.